Vaping the new Davide from AnyVape seems exactly like vaping a ProTank when you do it with your eyes closed. Performance is nearly identical, but it’s the differences in design that make the Davide interesting. The Davide is a bottom coil changeable (BCC) design, meaning that the heating element is on the bottom and can be replaced easily. It’s being marketed as a glassomizer to highlight the glass construction of the tank, but it could just as easily be referred to as a clearomizer or tank. 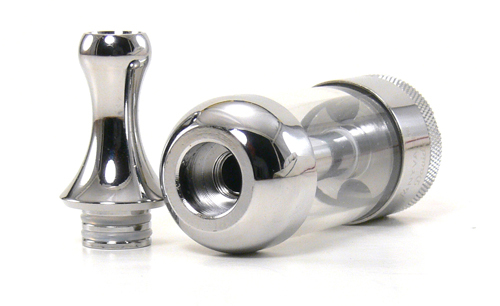 The coil itself is incorporated into a replaceable head that screws into the base of the tank. This head appears to be identical to the head in the ProTank. Two 2.2 ohm heads were shipped with the tank and both tested within .1 ohm of the stated resistance. A variety of resistance options are becoming available. 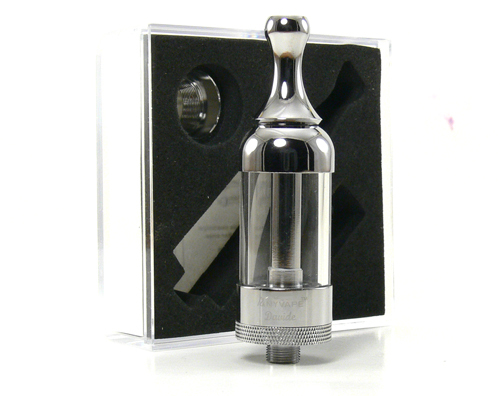 The base screws onto the 2.5ml tank in the same way that the ProTank does. Grooves in the bottom for better airflow are also similar as is the standard 510 connection and the addition of an eGo trim ring. The base screws onto the tank easily and securely and is easily removed for filling. 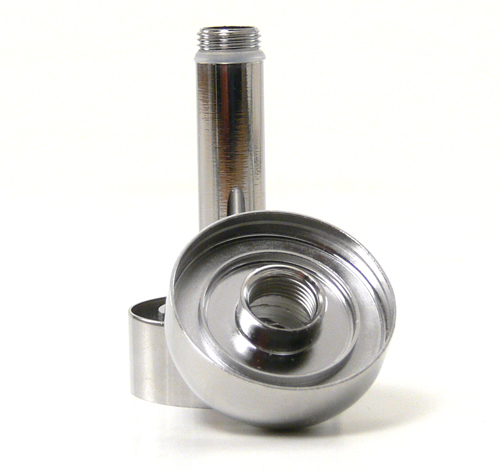 When taking the tank off of a device, it should always be gripped by the knurled base to avoid separating the tank. Because the base is designed a little differently than the ProTank, the area for filling is limited to two holes along the edge. A syringe tip would make filling a little easier, but I had no problems filling with a standard dropper bottle. We’ve spent a lot of time noting the similarities between the Davide and ProTank, but there is quite a difference in the design of the tank portion. Rather than a one piece tank that is molded together from mouthpiece to base, the Davide’s separates into four separate components. The top is connected to the base by screwing onto the center post, which rises from the center of the base. The glass tube is then firmly clamped between the two to form the tank. Silicon gaskets make a leak proof seal. 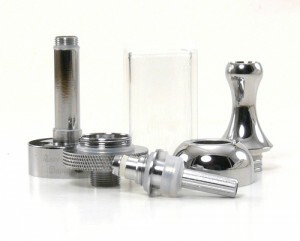 The metal tip is also removable so that any 510 drip tip can be used. The Davide worked well right out of the box, although as in many of the bottom coils we tested, a slight wick adjustment was in order. After a few repeated draws, the flavor dropped off into a slightly burnt flavor – a dry hit, meaning the wick was not getting enough liquid to the coil. Blowing into the mouthpiece helped for a short while, but removing just a little of the wick corrected the problem for the long term. Notably, the flavor returned to normal with no lasting burnt flavor. 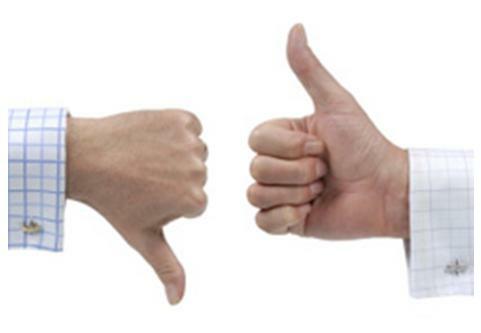 Vape quality is nearly identical to the ProTank, which is a good thing. Flavor and vapor production are fantastic. This tank produces an amazing amount of vapor. Throat hit and warmth are also very good, although like the Protank, the draw is a little on the airy side. 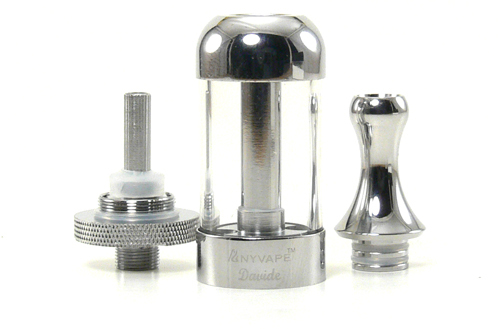 Consistency is where the Davide really shines – the vape is the same from full to empty. The modular tank has proven to be a slight advantage during a first cleaning. Being able to separate the components just makes things that much easier. Being able to change the drip tip is also nice, although I have gotten quite used to the metal one. The Davide from Anyvape is obviously aimed squarely at the Kanger ProTank, but it’s nice to see a variation rather than a copy. At $15.99 from Viper Vape, it costs $1 less than the ProTank, so that alone is a slight advantage for a budget watcher like me. The modular construction is also a benefit. Beyond that, it may be just another BCC tank, but that’s a good crowd to be in. Note: The Davide was provided for the purposes of this review by Viper Vape. I appreciate receiving models for review and it really helps me to be able to bring more reviews and photos to you. I try hard not to let it influence the review, however.